Project is expected to take five years to complete and cost over $60 million. 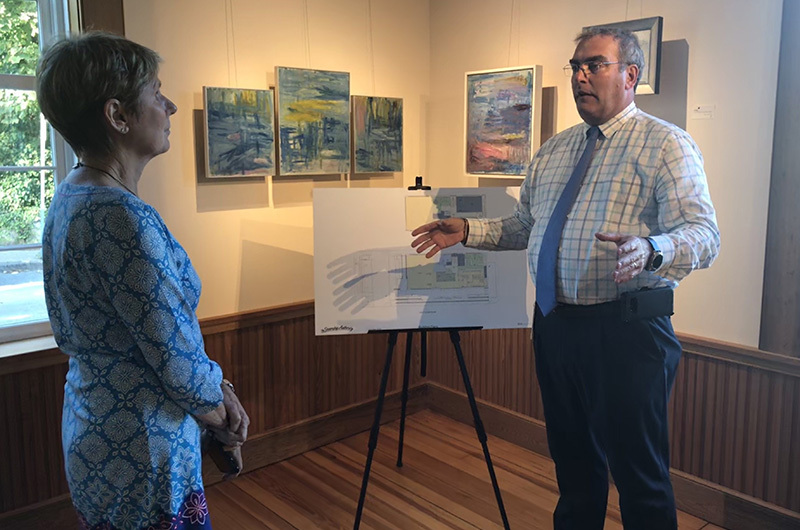 About a dozen people attended a Steamship Authority open house held in Vineyard Haven Wednesday to share plans for a sweeping redesign of the Woods Hole ferry terminal. The group of mostly older adults included year-round and seasonal Islanders and three Woods Hole residents, who bicycled to the Martha’s Vineyard Playhouse after taking the ferry to Oak Bluffs. 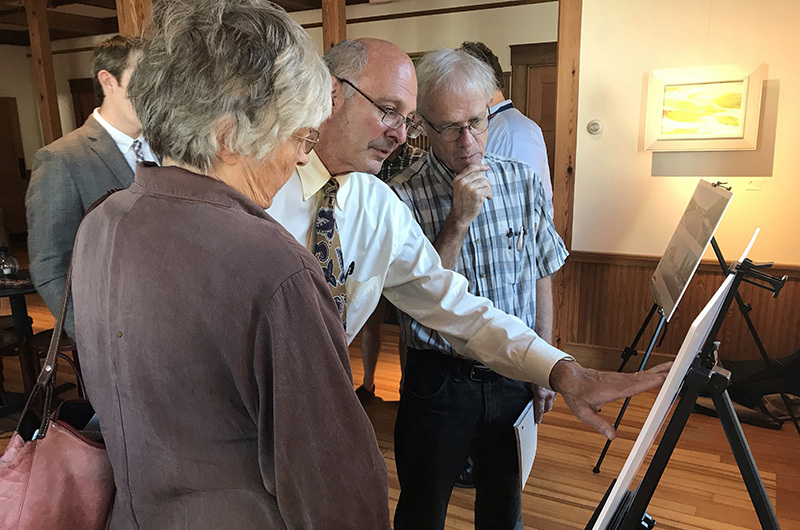 Following a Tuesday night presentation in Woods Hole, in which many village residents assailed the plan, the Vineyard open house was an informal affair in the playhouse lobby. Four easels held architectural renderings and site plans for the reconfiguration, which is expected to take at least five years and more than $60 million to accomplish. Boat line officials, including operations director Mark Rozum, communications director Sean Driscoll and Bill Cloutier, project manager for the redesign, greeted visitors and took them through the drawings in small groups. Project architects Chris Iwerks and Lian Davis were also on hand to answer questions. A projector screen displayed images of other prominent Woods Hole buildings with a variety of styles and sidings. Director of security Larry Ferreira — whose position is mandated by the Coast Guard, he said — quietly observed the proceedings from various spots around the lobby. Whether or not his presence there was also mandated by the Coast Guard, a smiling Mr. Ferreira said federal law prevents him from discussing any details of his work. 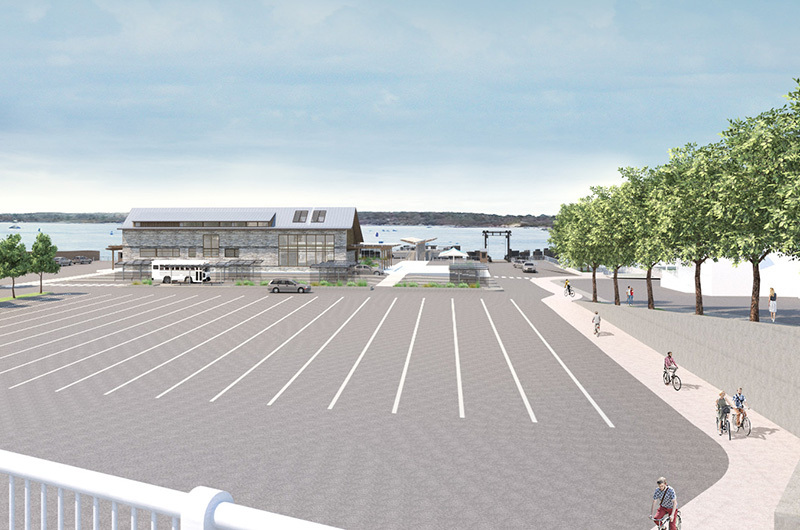 Ms. Cabral, who summered in Woods Hole for many years before moving to the Vineyard, said she is upset by the 35-foot height of the new two-story terminal, which must be built above flood plain level. It will block the view of the Woods Hole passage from the Crane Street bridge, a heart-lifting sight for almost anyone coming into the village, she said. Mr. Davis replied that while the water view from the bridge will be affected, the redesign opens other vistas. “It’s not going to block the entire harbor,” he said. The passage will still be visible from other angles, he added. At least 26 locations for the building were studied before the final spot was chosen, officials said. Mr. Iwerks had the study plans with him in a spiral-bound report that if animated, would have shown the purple rectangle representing the structure moving from place to place and changing orientation around the waterfront property. Islander Anna Edey, a longtime advocate for sustainable design, was more concerned with the design of the terminal itself than with its location. The expanses of glass in the waiting room are “an invitation to difficulty” when it comes to energy use, she said. “The business community wanted an open atmosphere,” said Mr. Cloutier, referring to a working group of Woods Hole business people who conferred with the architects on the building design. “Is there any solar planned at all?” Ms. Edey pressed. “Well, the community doesn’t hang out at the boat terminal,” Ms. Edey responded. “At last night’s meeting, you’d think they lived there,” Mr. Cloutier said wryly. Energy use and building size both concern Rebecca Truman, one of the Woods Hole residents who attended Tuesday’s presentation there and bicycled to the one in Vineyard Haven Wednesday. “It uses coal for electricity and it blocks the view of Woods Hole [passage] — the namesake of Woods Hole,” she said. And she disputed the assertion that the village community had opposed solar power for the building. “That is an outright lie,” Ms. Truman said. She had a third concern: increased capacity when the rebuilt slip 3 goes back into service. Formerly a maintenance slip, slip 3 will become as fully operational as the other two, with ferries arriving and departing throughout the day. “They’re making it possible for tens of thousands of people to show up, which will wreck this Island,” she said. Ms. Cabral expressed pessimism that community members will be able to sway the boat line, which is already behind schedule on the terminal reconstruction. Parking, in fact, is one thing the redesign lacks. With buses, trucks, automobiles and walk-on passengers to accommodate, there’s no room for more than a few pick up/drop off spots at the terminal. Islanders who were unable to attend the open house can view the plans at steamshipauthority.com/news/15-woods_hole_ferry_terminal_reconstruction_project. Public comments can be made again on Tuesday at the monthly meeting of the Steamship Authority board of governors, which begins at 4 p.m. in the Martha’s Vineyard Regional High School Performing Arts Center. Thanks to the architects and SSA folks for coming over. They were very forthcoming with information. The challenges of designing the terminal building are many. Too bad more people didn't show, but between the lack of publicity and the awkward time for working folks, even a dozen or so is a decent turnout. Tuesday at 4PM at the high school is our community's next chance to give some input. Again the timing is not good for working people or those with children, but attend if you possibly can! Once again the powers located within the SSA are listening to themselves $$$ And the minority of others. With each additional car to the island, our way of life has changed to the negative. Like a tree growing. You don't notice it untill it gets to big and begins to block the view. So it is with the SSA. We hear we need more boats. Why? We hear record breaking vehicals transported. Why? We hear record breaking passengers. Why? As a washashore, I don't believe in a closed door policy. I do believe in sustainability. And what the majority of the people searching for here is a community that once thrived throughout many urban towns in the USA. Neighbors without wooden fences. Repairable stone walls, healthy competition.i Here is where the SSA doesn't take any responsibility to what happens once their charges are picked up and dropped off. Delivered to areas unequiped to Handel the influx. They don't maintain the roads the population growth, the pollution of our water, or the air. They have no concern once any vehical gets within 1,000 feet of their property. Then it becomes a free for all. It really is time to stop the unchecked growth of the SSA. It's time to think of the communities of Falmouth, Woods Hole, Vineyard Haven and Oak Bluffs and the additional burdens we bare which in turn MAKES us even more vulnerable to the SSA and their incessant need to be bigger and inhale more $. Without time lapse photography you will never see how big a tree gets by watching it grow until the view is gone. Completely insane. Wrong Wrong. Wrong. There are no losers. It's called democracy! The number one concern for all VINEYARDERS should be what this new design will ultimately allow SSA to do to the amount of traffic congestion on the Vineyard in the Summer. Will the new design increase the amount and size of landing ramps so SSA can run bigger or more ferries to the Vineyard? It appears to me that given this new design SSA will gain the capacity to launch more ferries and deposit more passengers cars and trucks on the island. In the summer this may be a huge issue. The last thing we all need in July and August is a 20% increase in auto traffic because this design and the bylaws give SSA the ability to dump more cars, trucks and passengers on the island. I believe we need to be asking SSA what assurances they can offer us that they will not increase service based on the new design. We must ensure that traffic congestion on the VINEYARD does not get to the unmanageable level that we now see on NANTUCKET. Be wary because stop lights may come to a neighborhood near you. Hmmm.. The SSA doesn't't have a reputation of going solid "assurances". Remember when they requested the 2nd VH slip ?? They "assured" the public that it it would never be used together w/ slip # 1. So much for that assurance.. Their business model is growth base to afford their many vanity projects.. There is nothing wrong with stop lights people! Used in the Summer only, places like Upper Main Street might be passable in a reasonable time. The side street across from Stop & Shop exit near the bank should be ONE WAY going away from Upper Main Street for 2 months. There are many simple solutions to Island problems. We don't need to analyze the hell out of everything. I question whether the "old" terminal really had outlived its useful life. The assessment was done by a company hired by the SSA. That is by definition not objective. The SSA wanted the third slip. Period. That is the only reason the "old" terminal had to come down, IMO. Now we have to put up with a gigantic "chalet" in the middle of Woods Hole. Looks like being totally energy inefficient. We have to pay for those bills, too. Cold in winter, a greenhouse in summer unless a lot of money spent for cooling. It is just dumb. The opportunity for educating Island visitors by constructing a state-of-the-art energy-neutral or even energy-generating building appears to have been blown. This is particularly egregious in a seaside setting--- where, in addiition, the Woods Hole Research Center, a private nonprofit, has put up an energy-neutral building just up the road. What is the state thinking? Steve Sayers's arguments for the need for a new terminal when he came to the High school in can't recall exact year were weak and emotional. One of the more bizarre reasons he gave was that the ramps to the boats were "a maze." Well, they conform to to the ADA, so not "a maze." That meeting was well attended. They didn't listen to residents then and they won't listen to them now. This is just a dog and pony show. You can't stop these SSA juggernauts once they get going, or make managers and execs grasp the 21st-century "big picture." I appreciate the SSA working to expand. I've only briefly viewed the plans. I'm sure the architects have spent many hours and hours looking that them. I appreciate their work. The one thing that jumped out at me is that if you are sitting in your car in the lot waiting it will be hard to see what ferry just came in because the building will be in the way. Putting up some kind of large display that shows the location of each ferry and expected time of arrival and what not would probably make the waiting easier on the passengers. It would certainly help those people who are sitting in their car wondering if they have time to use the restroom before loading. The massive glass expanse as well as a second floor for workers and their lockers should not be priorities of the SSA or the architects. And anyone who enjoys the Cape and Islands most assuredly respects the importance of solar power. Woods Hole citizens have every right to ask for a single story, solar-powered building, in keeping with the rest of the town. How is it you concluded that anyone who enjoys the Cape & Island respects the importance of Solar? I would add that back in the nineties the SSA, similarly, did not listen to residents when they erected the "passenger pickup" structure that ruined the view of VH harbor. Oh, right, twenty years later they realized they had made a big boo-boo and the thing was removed. How much did that removal cost? Did anyone at the SSA say: "The public was right and we are sorry." Did any manager, or governor, take responsibility for that BAD decision to override the public---their putative constituents (lifeline from the Island and all that)---and build that thing despite a chorus of protest? Are there any bookies out there taking bets on how long the "chalet" will last? Will it be labeled "old" and "out of date" and "unsound" in 2038? And what about the maintenance costs on all of the glass? Who needs a casino in Aquinnah with all of these betting ops right in Vineyard Haven! I question the need for another building after the new one at the palmer lot. I've been to several other large ferry locations in the US and they look to have a much smaller footprint than the ssa. Has the ssa looked at the cape may to delaware ferry facilities and the washington to vancouver facility unless I'm wrong they're both much smaller than ours. Would be great if they could invent an app to let you know when you need to return to the ferry line. Jut saying. I think the plans are a vast improvement over the current mess that is in Woods Hole. Better traffic patterns, better rain/weather cover, better every thing. Not having to play dodge cars getting on and off the ferry and not getting drenched in a rainstorm while walking on a great inprovements. I’m handicapped and having state of the art access will make my and other challenged/elderly passengers much easier. Kudos to the thoughtful designs and a long term solution. Coal? You're kidding. Who is running this thing, Scott Pruitt? The "experts" should note that California now requires any new construction use solar. It's cheaper, cleaner and the way of the future. I'm shocked, and this is a tip-off to some of the myopic decisions on everything else. SSA operates in a vacuum, deftly and deliberately. Look at Washington State Ferry and you see design with purpose...employees and community involved with calm and candor that common purpose brings: SSA cannot grasp or even conceive the principle of participative planning and management. It’s not in the DNA of “ how it’s always been done..”.